Hi! My name is Alish Clairmont! I have been lucky enough to visit Disney World as a child, young adult, and now with my children! What a new experience to take my children and see it through their eyes! We first went as a family when my 2 oldest children were 4 and 2 and we have been hooked ever since, visiting every year! My husband and I have even experienced the fun of a RunDisney event! I live in Marietta, GA with my husband and 3 kids. 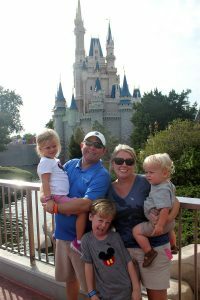 We are all Disney fanatics and love spending our family vacations at Disney World. We have stayed at many of the resorts, spent lots of time at all 4 parks, and love the dining options. I can’t wait to use my experiences, knowledge, and resources to help others plan the perfect trip! I know traveling to any Disney destination can be overwhelming and I would love to help you plan your magical vacation that will fit your family’s lifestyle and budget. Whether it is your first trip or you go every year, I am excited to help you plan every detail. And the best part is, my services are free! Wow! Alish, you are a lifesaver! You made me look great! Everything went so smoothly and we never had such a fun time. The smile on the kids’ faces said it all! When can we start planning our next trip?!? I’m so glad Rich referred me to you! My anxiety level was sky high and after our first conversation, I knew I was in excellent hands with you planning our vacation! To be honest, I wasn’t sure what to expect, but I’ll never go to Disney again without your help….thanks again, Alish! I’ve already referred you to some of my friends & neighbors! This was easily the best experience I’ve had using a travel agent. Alish was exceptional! Her knowledge of all the Disney parks is amazing! Do yourself a favor and give her a call if you want to plan a vacation you and your family will cherish forever.